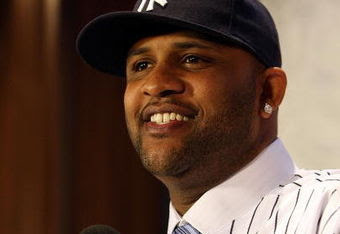 The Yankees signed CC Sabathia to a seven-year, $161 million deal this offseason, which marks the highest contract ever for a pitcher. I believe that Sabathia should have won the NL Cy Young Award last season, as I also believe that he was the best pitcher in all of baseball. I think his most valuable trait is his durability. He's thrown 494 innings over the past two seasons, which leads all major league pitchers by 22 2/3 innings. He also leads the majors in games started in the past two seasons with 69. If you do the math, he has averaged a little over seven innings pitched per start. This means, that he will only need one to two relief pitchers on average. He saves the bullpen better than any other pitcher in the majors, except for maybe Roy Halladay. Now, if you think about the Yankees' troubles throughout this decade, the bullpen is one of the main issues that has prevented the Yanks from winning their 27th World Series. Sabathia will not be added to this list because of his freak ability to stay healthy. His brief DL history has always seems to occur in the early part of the season. In the past, he has made up for his slow starts with strong finishes to seasons. His career ERA in September is 2.77. I believe Sabathia can be important enough to the Yankees, that at least these first seven years of the new Yankee Stadium will be known as the "CC Era".